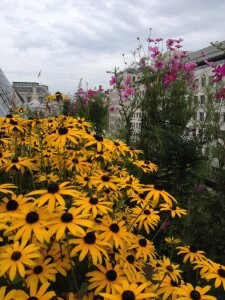 Recently I was privileged to be given a private tour of the Coutts Skyline Garden, high above The Strand in London, a stone’s throw from Charing Cross Station. The ingenious project of Richard Vine, who pioneered hydroponic cultivation and micro-salads, this roof garden produces vegetables, fruit and flowers for use in the kitchens of Coutts, the renowned private bank and wealth manager, using raised beds along the edges of the building. With his commitment to organic principles and total dedication to top quality, Richard works closely with the executive chef, Peter Fiori, who had the original idea of producing a range of herbs, salads, berries and blossom right through the horticultural year. Care is taken to ensure that as one type of fruit comes to an end, a new one begins. Coutts are enthusiastic supporters of the project. Country Garden – overlooks the Strand with an eclectic and colourful mix of shrubs, climbers and perennials selected to provide nectar for insects which aids pollination, and wildlife habitat. The micro-climate which surrounds the site offers many challenges including the winds which can eddy round the roof, buffeted by surrounding higher buildings; deep shade on the north side and high temperatures on the south and west sides as the sun is absorbed by the lead roofing of the building and reflected back to the plants. However Richard turns these to his advantage wherever possible, selecting soft fruit and Mediterranean herbs for the hot spots and persuading more robust vegetables and flowers to withstand the cooler zones. The site also fulfils its social responsibilities; the 300 wooden raised beds were built by inmates of HMP High Down as part of the initiatives run by the Clink Charity. They are beautifully made and are deep enough to ensure that plants and vegetables have enough root space to flourish. Irrigation systems on timers ensure that the plants receive optimal treatment to deliver maximum flavour and punch. But this is not simply a productive roof garden. Richard Vine has tried where possible to grow rare and heritage varieties, and where possible to link the heritage of Coutts to his planting. Thus two plum trees, Prunus domestica ‘Angelina Burdett’ (named after the philanthropist Angelina Burdett-Coutts), flourish in the Meadow Garden. Organic methods are used wherever possible and Richard raises generations of young plants at home to ensure that gaps never appear. What was once a windswept, empty space of dark gravel, lead sheeting and black iron railings has been transformed by the vision of one man into a well managed and ordered jungle of delights. Food miles have been reduced to food inches and birds, bees and butterflies have a new crash pad in Central London. Coutts are to be praised for their commitment to environmental issues on their own doorstep. I very much hope to be invited back to see what happens in the springtime. In the meantime, Richard’s regularly updated Facebook postings give tantalising glimpses of the beds and their produce and there is a good introductory video clip to fill in the background detail.